Metastatic bone disease occurs when cancer spreads from a primary organ site to bone. The spine is the most common location of metastatic disease. See the image below. Lateral radiograph shows sclerotic metastasis of the L2 vertebra in a 54-year-old man with prostatic carcinoma. Pain is an important symptom of musculoskeletal metastases, but it is nonspecific. The pain pattern can be helpful if, in addition to being activity related, it is present at rest and at night, especially in patients older than 50 years. However, this pain pattern can be present in patients with osteomyelitis and Paget disease, and in these instances, it is also nonspecific. Biopsies should be obtained from any soft-tissue mass or, if no soft-tissue mass is present, from the most accessible bone in a mechanically safe area (eg, metaphysis vs diaphysis, acetabulum vs subtrochanteric femur). The life span of patients with metastatic bone disease is limited; thus, the goal of management needs to be centered on returning as much function as possible as rapidly as possible. Patients with metastatic bone disease are generally treated with surgery or radiation therapy. Radiation therapy remains a primary therapeutic modality for the treatment of spinal metastasis, because nearly 95% of patients who are ambulatory at the start of radiation therapy remain so. Consequently, the possibility of regaining cord function once it is lost as a result of spinal metastasis is dismal. Therefore, such loss needs to be avoided by early diagnosis, treatment, and, if indicated, surgical intervention. The red marrow theory, combined with knowledge about the cytokine stimulation of metastases, provides an excellent explanation of how this distribution occurs. Metastases distal to the knee and elbow are extremely uncommon, but approximately 50% of these acral metastases are secondary to primary lung tumors. Carcinomas, such as those of the breast and prostate, rarely exhibit such a distinct pattern. Cells from the primary site must, through the process of neovascularization or through migration to the nearest blood vessel, attach to the basement membrane of the vessel wall and produce proteolytic enzymes that disrupt the basement membrane. The cells then migrate through the basement membrane and float away in the bloodstream to a distant site. The process through which these tumor cells are attracted to a specific site in the body is not completely clear, though type I collagen, a byproduct of bone resorption, has been shown to be a chemotactic factor that attracts tumor cells to bone. If they survive the journey to the distant site, the tumor cells attach to the basement membrane of the vessel wall using proteolytic enzymes (integrins/cadherins). After disrupting the receptor site basement membrane, they migrate into the substance of the distal host tissue. Producing chemotactic factors, as well as RANK ligand (a transmembrane or soluble protein essential for the formation, function, and survival of osteoclasts), these cells stimulate osteoclast activity, causing bone resorption and leading to the formation of pockets or holes in the bone in which the tumor cells grow. Approximately 1.2 million patients present with cancer each year in the United States. Of these, approximately 600,000 persons have metastases to bone. In contrast, 2,700 patients per year develop primary bone sarcoma. The age range of patients with sarcoma is different from that of individuals with carcinoma of bone; most metastatic bone lesions occur in adults older than 50 years, while most sarcomas occur in adolescents or young adults (<30 years). Therefore, a bone-occupying mass in an adult is much more likely to be a focus of metastatic carcinoma than to be a primary sarcoma of bone. However, in a patient with a bone lesion with no documentation of metastatic disease, caution is warranted to ensure the correct diagnosis. In addition, perioperative complications occur more frequently among patients with skeletal metastases; the perioperative mortality rate in this population is approximately 8%, and the perioperative infection rate is approximately 4% (although the infection rate is higher at previously irradiated sites). Most patients with metastatic bone disease survive for 6-48 months. In general, patients with breast and prostate carcinoma live longer than those with lung carcinoma. [14, 15] Patients with renal cell or thyroid carcinoma have a variable life expectancy. Kirkinis et al studied 462 patients presenting with metastatic bone disease to the extremities or pelvis who underwent orthopedic treatment. Overall surival rates were 45% at 1 year, 29% at 2 years, and 13% at 5 years. Preoperative hemoglobin was found to be an independent predictor of better survival; lung histotype, age, pathologic fracture, and previous combined therapy were negative predictors of survival. British Association of Surgical Oncology Guidelines. The management of metastatic bone disease in the United Kingdom. The Breast Specialty Group of the British Association of Surgical Oncology. Eur J Surg Oncol. 1999 Feb. 25(1):3-23. [Medline]. Zeng L, Chow E, Bedard G, Zhang L, Fairchild A, Vassiliou V, et al. Quality of life after palliative radiation therapy for patients with painful bone metastases: results of an international study validating the EORTC QLQ-BM22. Int J Radiat Oncol Biol Phys. 2012 Nov 1. 84 (3):e337-42. [Medline]. Frankel BM, Jones T, Wang C. Segmental polymethylmethacrylate-augmented pedicle screw fixation in patients with bone softening caused by osteoporosis and metastatic tumor involvement: a clinical evaluation. Neurosurgery. 2007 Sep. 61(3):531-7; discussion 537-8. [Medline]. Harrington KD. Orthopaedic management of extremity and pelvic lesions. Clin Orthop Relat Res. 1995 Mar. (312):136-47. [Medline]. Keene JS, Sellinger DS, McBeath AA, et al. Metastatic breast cancer in the femur. A search for the lesion at risk of fracture. Clin Orthop Relat Res. 1986 Feb. (203):282-8. [Medline]. Quattrocchi CC, Piciucchi S, Sammarra M, et al. Bone metastases in breast cancer: higher prevalence of osteosclerotic lesions. Radiol Med (Torino). 2007 Oct. 112(7):1049-59. [Medline]. Alarmo EL, Kallioniemi A. Bone morphogenetic proteins in breast cancer: dual role in tumourigenesis?. Endocr Relat Cancer. 2010 Jun. 17 (2):R123-39. [Medline]. Doot RK, Muzi M, Peterson LM, Schubert EK, Gralow JR, Specht JM, et al. Kinetic analysis of 18F-fluoride PET images of breast cancer bone metastases. J Nucl Med. 2010 Apr. 51(4):521-7. [Medline]. Hung JJ, Jeng WJ, Hsu WH, Wu KJ, Chou TY, Hsieh CC, et al. Prognostic factors of postrecurrence survival in completely resected stage I non-small cell lung cancer with distant metastasis. Thorax. 2010 Mar. 65(3):241-5. [Medline]. Edwards J. Src kinase inhibitors: an emerging therapeutic treatment option for prostate cancer. Expert Opin Investig Drugs. 2010 May. 19 (5):605-14. [Medline]. Mundy GR, Yoneda T. Facilitation and suppression of bone metastasis. Clin Orthop Relat Res. 1995 Mar. (312):34-44. [Medline]. Guise TA, Yin JJ, Taylor SD, Kumagai Y, Dallas M, Boyce BF, et al. Evidence for a causal role of parathyroid hormone-related protein in the pathogenesis of human breast cancer-mediated osteolysis. J Clin Invest. 1996 Oct 1. 98(7):1544-9. [Medline]. [Full Text]. Harrington KD. Orthopedic surgical management of skeletal complications of malignancy. Cancer. 1997 Oct 15. 80(8 Suppl):1614-27. [Medline]. [Full Text]. Yazawa Y, Frassica FJ, Chao EY, et al. Metastatic bone disease. A study of the surgical treatment of 166 pathologic humeral and femoral fractures. Clin Orthop Relat Res. 1990 Feb. (251):213-9. [Medline]. Hirbe AC, Morgan EA, Weilbaecher KN. The CXCR4/SDF-1 chemokine axis: a potential therapeutic target for bone metastases?. Curr Pharm Des. 2010. 16 (11):1284-90. [Medline]. Kirkinis MN, Spelman T, May D, Choong PFM. Metastatic bone disease of the pelvis and extremities: rationalizing orthopaedic treatment. ANZ J Surg. 2017 Nov. 87 (11):940-944. [Medline]. Mirels H. Metastatic disease in long bones. A proposed scoring system for diagnosing impending pathologic fractures. Clin Orthop Relat Res. 1989 Dec. (249):256-64. [Medline]. Hipp JA, Springfield DS, Hayes WC. Predicting pathologic fracture risk in the management of metastatic bone defects. Clin Orthop Relat Res. 1995 Mar. (312):120-35. [Medline]. Kawaguchi M, Tateishi U, Shizukuishi K, Suzuki A, Inoue T. 18F-fluoride uptake in bone metastasis: morphologic and metabolic analysis on integrated PET/CT. Ann Nucl Med. 2010 May. 24 (4):241-7. [Medline]. Freedland SJ, Richhariya A, Wang H, Chung K, Shore ND. Treatment patterns in patients with prostate cancer and bone metastasis among US community-based urology group practices. Urology. 2012 Aug. 80 (2):293-8. [Medline]. Callstrom MR, Dupuy DE, Solomon SB, et al. Percutaneous image-guided cryoablation of painful metastases involving bone: multicenter trial. Cancer. 2013 Mar 1;119(5):1033-41. [Medline]. Barrett-Lee P, Casbard A, Abraham J, Hood K, Coleman R, Simmonds P, et al. Oral ibandronic acid versus intravenous zoledronic acid in treatment of bone metastases from breast cancer: a randomised, open label, non-inferiority phase 3 trial. Lancet Oncol. 2014 Jan. 15(1):114-22. [Medline]. Wong MH, Stockler MR, Pavlakis N. Bisphosphonates and other bone agents for breast cancer. Cochrane Database Syst Rev. 2012 Feb 15. 2:CD003474. [Medline]. Irelli A, Cocciolone V, Cannita K, Zugaro L, Di Staso M, Lanfiuti Baldi P, et al. Bone targeted therapy for preventing skeletal-related events in metastatic breast cancer. Bone. 2016 Jun. 87:169-75. [Medline]. Zaikova O, Fosså SD, Bruland OS, Giercksky KE, Sandstad B, Skjeldal S. Radiotherapy or surgery for spine metastases?. Acta Orthop. 2011 May. 82(3):365-71. [Medline]. Orita Y, Sugitani I, Matsuura M, Ushijima M, Tsukahara K, Fujimoto Y, et al. Prognostic factors and the therapeutic strategy for patients with bone metastasis from differentiated thyroid carcinoma. Surgery. 2010 Mar. 147(3):424-31. [Medline]. [Guideline] Redmond KJ, Lo SS, Soltys SG, Yamada Y, Barani IJ, Brown PD, et al. Consensus guidelines for postoperative stereotactic body radiation therapy for spinal metastases: results of an international survey. J Neurosurg Spine. 2017 Mar. 26 (3):299-306. [Medline]. [Full Text]. Clayer MT, Tang X. Low risk of cardiac events during intramedullary instrumentation of lung cancer metastases. Acta Orthop. 2007 Aug. 78(4):547-50. [Medline]. [Full Text]. Camnasio F, Scotti C, Peretti GM, Fontana F, Fraschini G. Prosthetic joint replacement for long bone metastases: analysis of 154 cases. Arch Orthop Trauma Surg. 2008 Aug. 128 (8):787-93. [Medline]. Forauer AR, Kent E, Cwikiel W, et al. Selective palliative transcatheter embolization of bony metastases from renal cell carcinoma. Acta Oncol. 2007. 46(7):1012-8. [Medline]. Chow E, van der Linden YM, Roos D, Hartsell WF, Hoskin P, Wu JS, et al. Single versus multiple fractions of repeat radiation for painful bone metastases: a randomised, controlled, non-inferiority trial. Lancet Oncol. 2014 Feb. 15 (2):164-71. [Medline]. Nieder C. Repeat palliative radiotherapy for painful bone metastases. Lancet Oncol. 2014 Feb. 15 (2):126-8. [Medline]. [Guideline] Lutz S, Balboni T, Jones J, Lo S, Petit J, Rich SE, et al. Palliative radiation therapy for bone metastases: Update of an ASTRO Evidence-Based Guideline. Pract Radiat Oncol. 2017 Jan - Feb. 7 (1):4-12. [Medline]. Lateral view of the femur of a 70-year-old man with metastatic prostate carcinoma, the most common cause of osteoblastic metastases in men. 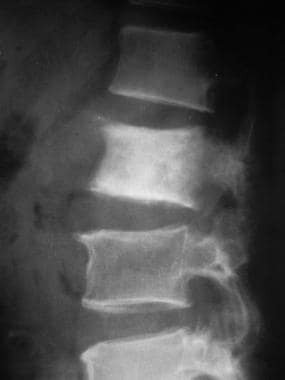 Radiograph of a patient with severe rest- and activity-related pain at the time of presentation. Pathologic fracture. Radiograph shows a displaced fracture through an osteolytic lesion in the distal femur of a 53-year-old woman with lung carcinoma. Radiograph shows osteolytic metastasis in the distal femur of a 51-year-old woman with breast carcinoma. Axial computed tomography scan shows 2 rounded, mixed osteolytic-sclerotic lesions in the thoracic vertebral body of a 44-year-old woman with lung carcinoma. Axial computed tomography scan shows a destructive osteolytic lesion in the left acetabulum of a woman with vulval carcinoma. Soft-tissue extension into the pelvic cavity is present. Sagittal spin-echo T2-weighted magnetic resonance image shows hypointense lesions in the T10 and L3 vertebrae in a 66-year-old man with lung carcinoma. The tumor involves the T10 pedicle. See also the next image. Sagittal short-tau inversion recovery magnetic resonance (MRI) from a 66-year-old man with lung carcinoma. This MRI shows hyperintense lesions in the T10 and L3 vertebrae, with T10 pedicular involvement. Sagittal short-tau inversion recovery (STIR) magnetic resonance image (MRI) in a 68-year-old man with thyroid carcinoma. This MRI shows severe compression of the L1 vertebra with retropulsion. Affected T11-L2 vertebrae show signal hyperintensity, posterior vertebral body marginal bulging, and spinal canal narrowing. See also the next image. Sagittal gadolinium-enhanced spin-echo T1-weighted magnetic resonance image from a 68-year-old man with thyroid carcinoma. This image shows heterogeneous enhancement of the T11-L2 vertebrae, with prominent epidural component enhancement and spinal canal compromise. See also the next image. Axial spin-echo T1-weighted magnetic resonance image (MRI) in a 68-year-old man with thyroid carcinoma. This MRI shows tumor extension from the L1 vertebral body and left pedicle into the left psoas muscle and epidural space, with resultant spinal cord compression. See also the next image. Axial gadolinium-enhanced spin-echo T1-weighted magnetic resonance image from a 68-year-old man with thyroid carcinoma. This image shows heterogeneous enhancement of the soft tissue component of the L1 vertebral metastatic tumor. Typical scintigraphic pattern of bone metastases in a 60-year-old man with nasopharyngeal carcinoma. This posterior technetium-99m bone scintiscan shows multiple randomly distributed focal lesions scattered throughout the skeleton, particularly the spine, ribs, and pelvis.